Sub Lieutenant Jovilisi Katonbiau from the Republic of Fiji Navy, takes a bearing while under the instruction of Sub Lieutenant Caitlin Watkins, on the bridge of HMAS Glenelg while entering Darwin Harbour during Exercise Kakadu 2018. 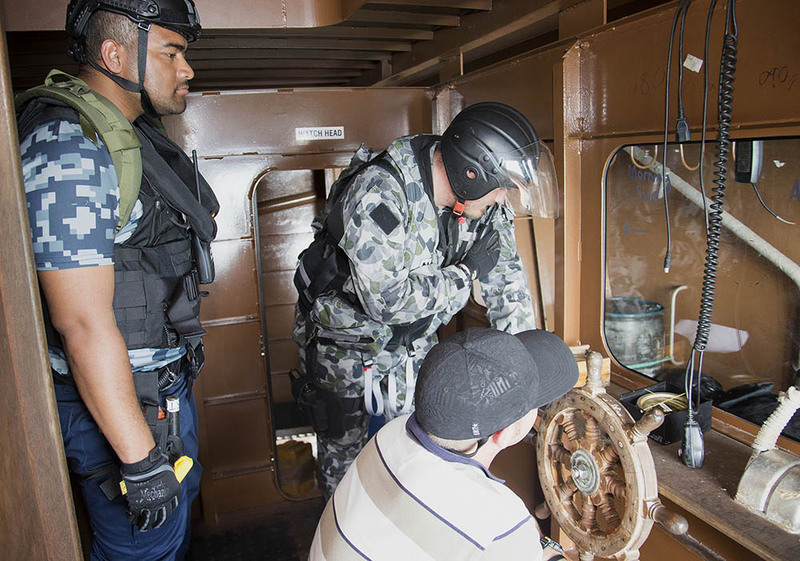 Patrol boat crews from Australia and Fiji have conducted joint boarding operations on a simulated illegal fishing vessel as part of Exercise Kakadu in the Northern Territory. Armidale class patrol boat HMAS Glenelg and the Republic of Fiji Navy ship Kikau conducted the joint exercise outside of Darwin Harbour. 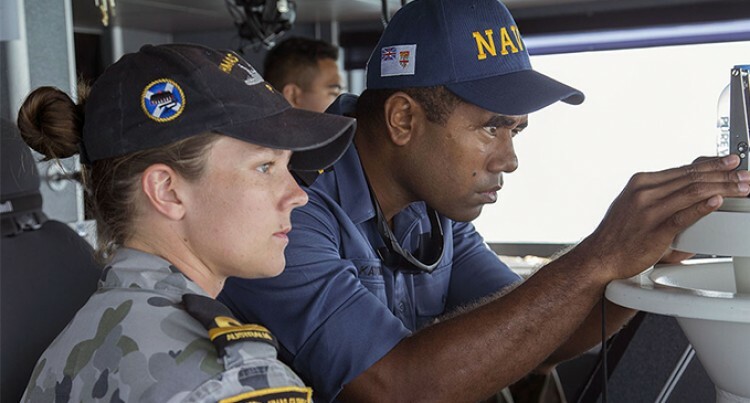 Australian and Fijian personnel worked side-by-side during the boarding operation and on the bridges of both patrol boats. Lieutenant-Commander Jorge McKee, Commanding Officer of Glenelg, said cross-training opportunities were essential and a key component of the Kakadu 18 exercise. “Working in the maritime domain together, co-operation is essential. We have shared problems so we need to come together and practise how to secure our maritime domain together,” LCDR McKee said. His counterpart on Kikau, Lieutenant Commander Joseva Tunidau, said that the sea phases of Kakadu 18 had allowed the crew to directly work alongside regional partners. “The joint exercise enhances our interoperability and allows us to test and develop our capabilities. “Illegal fishing is a major issue faced by all nations in the South Pacific and one where regional cooperation has proved beneficial. “We have threats from illegal fishing activity and maritime crime, so working alongside our international partners can build relationships and allow us to practise and hone our procedures,” LCDR Tunidau said. The exercise was also watched by international observers from Cambodia, Fiji, Tonga, Timor-Leste and Tuvalu. Tuvalu’s involvement was through the Royal Australian Navy’s watchkeeper secondment programme, which provides training opportunities within the region. Peletiso Filemoni, a Constable with the Tuvalu Police Maritime Wing, is on a four month secondment with Glenelg and took part in officer of the watch exercises on the return to Darwin. He said the four-month secondment programme would provide invaluable experience he can take back to Tuvalu, where illegal fishing in the nation’s waters was also an increasing problem. “One of my objectives is to observe how other countries do things and take this information back to my team,” he said.